One of the greatest challenges of the future, in a world affected by peak oil, damaged soil and climate change, is how to ensure our food. We stand before the greatest challenge that humanity has ever encountered. There are 7 billion people on the planet, and many of them are today dependent on an agricultural sector which is dependent on fertilizers based on chemicals and fossil resources. There are, however, alternatives. Organic farming for example. But for organic farming to become an alternative to the prevailing paradigm of large, monocultural fields, it needs to become less labour-intensive and be able to feed billions of people. That is why I found the ideas of Alexander Bascom and Green Free Will so intriguing when I first heard about them. The idea is to contain a self-regulating aquaponics system within an automated geodesic dome. This system will simulate an eco-system, with an artificial river floor world, filled with small aquatic animals, and a plant bed where vegetables, fruits and beans are grown. There will be a computerised regulation system inside the dome which would adjust to a number of variables – climate conditions, atmosphere, bacteria levels, nitrate levels and water levels, and change the conditions of the dome to keep a dynamic equilibrium. This choice represents the reality, where vegetables and fruits together stand for around 80% of the human calory intake, whereas aquatic food stands for 20% of the proteine intake for most people. Since soil will not be used, and the plants will be fertilized by organic manure produced by the aquatic eco-system, the internal eco-system will be sustainable, and will only require a minimum of external nutritional in-take (mostly iron). EOS has joined its forces together with Green Free Will, to make sure that this project is realised. Our aim is to raise a small, experimental prototype dome, made of plastic composites and located in Lögdeå, near Umeå. And we have received a grant which is covering a part of the cost. The grant is delivered by URnära, a LEADER project which helps with agricultural development in northern Sweden. The grant is covering the construction materials for the dome and the initial wages for the two project leaders, Alexander Bascom and myself. However, a condition for the grant is co-financing from other entities – from individuals and from associations and companies. Also, the grant does not cover the foundation digging, the aquaponics system nor the computer hardware and software. The grant is on 34.035 Euro (300.000 SEK), while the total cost of the project is 177.011 Euro (1.560.000 SEK). 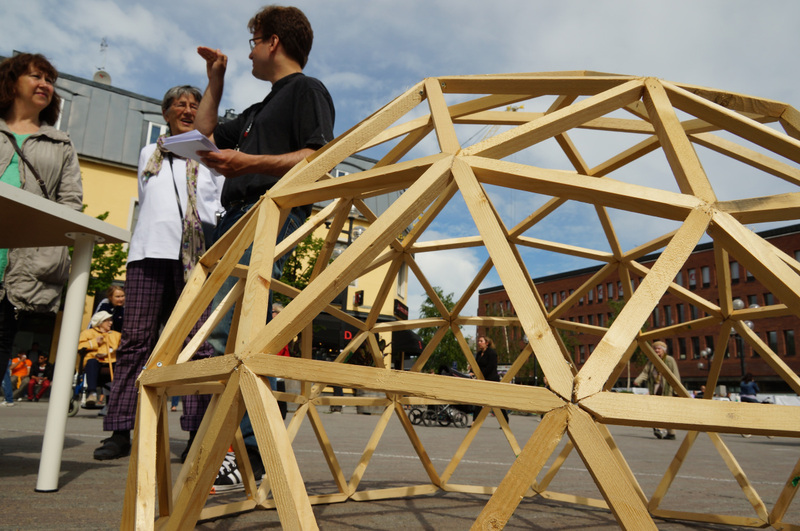 We have a deadline until the 30th of June 2014 to have the Dome up. You have an opportunity to help with achieving food sustainability, combine innovative new systems to make high-tech organic farming. The aim of this project is not to make a profit-driven enterprise, but to help individuals, communities and peoples achieve sustainable farming. Imagine roof-tops, private and public gardens and communities centered around dome-farming. Imagine a future where people once again can grow clean, unpolluted food in a sustainable way any time they want during the year, no matter where they live. This project has prospects from everything from ordinary gardening, to humanitarian aid, to space exploration. Contact person is Dr Andrew Alexander Wallace, Spanngränd 13, 906-28 UMEA, SWEDEN.